Crafty Lady’s ‘Bless You Turkey’! Thanksgiving is hands down the best holiday, am I right? It’s purpose is to surround yourself with loved ones and just be grateful for all that you have. Oh, and eat of course! The wonderful smells, the sound of laughter, everyone (hopefully) getting along, it’s all just so magical. Sometimes, so much hard work and planning goes into this one special day, we can lose sight of what it’s really all about…giving thanks! Once the card stock is dry, cut the feathers out and adhere to the back of the tissue box, layering as you go. 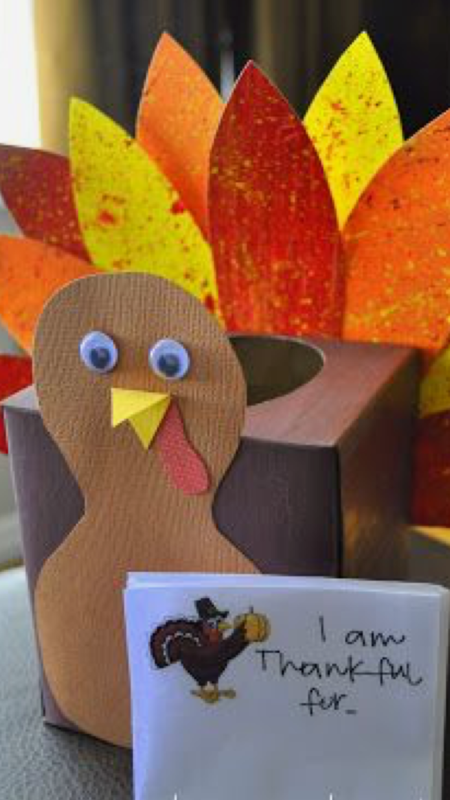 Create a turkey body, beak, and little dangly thing (seriously, what is that anyway) and adhere to the front of the tissue box. On index cards or printed from the computer, have a stack of “I am thankful for” note cards or place one at each place setting at the table. When guests are finished writing, they will fill the tissue box with all their blessings. These can be read aloud during dinner. Actual tissues may be needed for this portion. I wish all the SCC families a happy and healthy Thanksgiving! As always, post and tag pictures of your crafts on Instagram and Facebook. We love to see them!